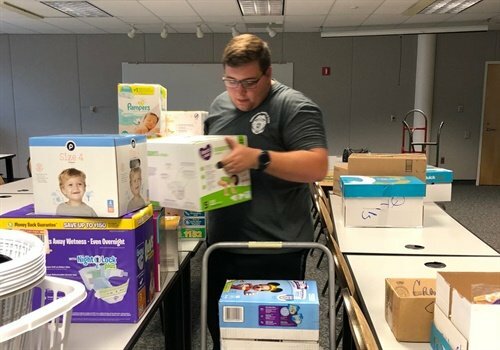 Members of the community joined officers with the Clearwater (FL) Police Department in gathering supplies to bring to survivors of Hurricane Michael. Image courtesy of Clearwater PD / Facebook. Following the devastation of Hurricane Michael last month, organizations from around the country have been sending supplies to Florida's Panhandle. One of those groups is the Clearwater (FL) Police Department, which has reportedly been gathering donations for the past two and a half weeks. According to WTSP-TV, the department has now filled up two large trucks with supplies and is gearing up to drive to the Panama City Beach Police Department. Meanwhile, in New Jersey, police are preparing to deliver donations to victims of Hurricane Florence in North Carolina. According to Spectrum News, officers with the Evesham (NJ) Township Police Department held a donation drive called "Operation Fill the Trailer." On Sunday the New Jersey officers traveled to New Bern, NC, to meet survivors and distribute the collected donations.